Home » Odds & Sods » What’s this? A Dalek Helping to Exterminate Antibiotic-Resistant Superbugs? What’s this? A Dalek Helping to Exterminate Antibiotic-Resistant Superbugs? 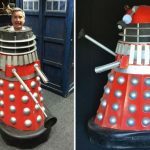 Standing guard in the reception area/foyer of BBC’s Broadcasting House in London is a Dalek that is, quite possibly, more valuable than the recent 1966 Dalek that sold for £38,000. 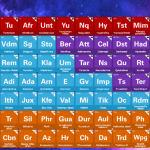 The Dalek in question was recently found to contain an interesting compound that could be used to solve an ongoing medical crisis. Bacteria that cause dangerous infections are become increasingly resistant to drugs, leading us inexorably towards the so-called antibiotic apocalypse. A recent report warned that antibiotic-resistant superbugs could kill upwards of 10 million people a year by 2050 if nothing is done about it. In an effort to develop new drugs, scientists are searching far and wide for bacteria and other microorganisms that might be used to combat superbugs. Scientists are currently on the hunt for undiscovered critters that may lurk at the bottom of the ocean or in our soil. 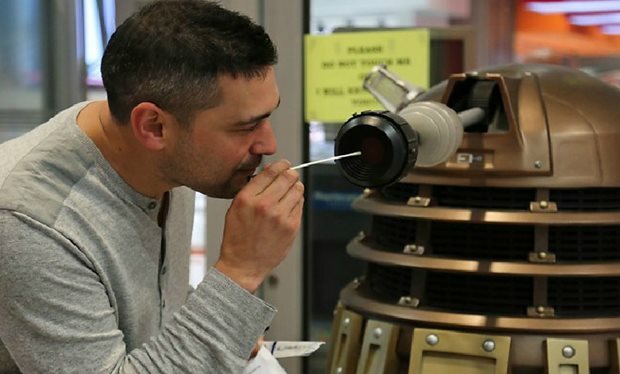 BBC Radio 4 Inside Science host Dr. Adam Rutherford partook in the experiment, taking samples from around the building, including microphones, door knobs—and the eyestalk of the iconic Doctor Who villain. The collected samples were cultured, and the resulting bacterial colonies analyzed. 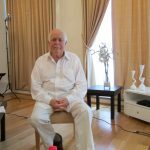 Earlier this week, Rutherford told the BBC Today program that, “The Dalek provided not one, but four potential novel antibiotics.” These samples, unlike the others, produced unique colonies of bacteria that appear to be producing antibiotics that could, in theory, be developed as medicine. “We’ve got at least three different types of bacteria from the Dalek that were able to ‘exterminate’ our Micrococcus indicator strain,” added Dr. Adam Roberts, the founder of the Swab and Send project. Listen to the moment Rutherford discovered the “good Dalek” below. You can catch the full episode of Inside Science on iPlayer. 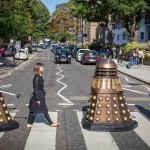 Why did the Dalek cross the (Abbey) Road?